Critical Thinking Activity: No Way! This game, Galactic Gloop Zoo, is designed to address a common misconception among students—that cold moves through space along with heat. Ordinary language supports this idea through such expressions as, “Don’t let the cold in.” The game also addresses the difference between heat and temperature. The mechanics of the Galactic Gloop Zoo game provide a model for the transfer of heat via radiation, convection, and conduction. The player has to bring enough heat to a set of fertilized eggs in a variety of different environments to cause them to hatch various types of creatures and populate a zoo in outer space. The game’s rules are a close match to the mechanisms of heat transfer, in that the interaction between the player’s avatar, Stan the zookeeper, and the various heat-carrying creatures causes more heat to flow to areas of less heat until either the interaction stops or the two parts have arrived at the same level of heat. Temperature is a measure of that heat, and reading temperature indicators (an optional feature) is a more efficient way to play the game than is relying on distinguishing the degree of color saturation, which is also an analogy for heat level. 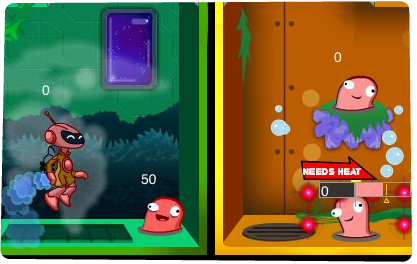 The various environments in the zoo represent the different ways in which heat can be transferred, and appear as different types of challenges in the game, which has many levels of difficulty. Galactic Gloop Zoo can be used with subtopics associated with heat transfer, such as the direction of transfer, thermal equilibrium, and insulators. Explanations and support materials for these are available in the Curricular Connections page.